BAKU (Trend) — Turkmenistan Airlines has been authorized to sign a contract with Boeing to purchase three Boeing 737 MAX 7 aircraft, including one aircraft intended for important flights, the Turkmen president’s decree reads. According to the decree, the new aircrafts are to be purchased in order to upgrade the air fleet, improve the quality service and ensure flight safety. The issue was discussed at a government meeting. 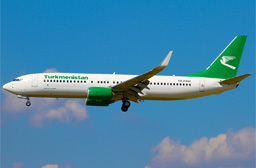 Apart from a unique Bombardier CRJ-700, the Turkmenistan Airlines fleet is composed of Boeing aircrafts: 7 B717, 13 B737, 2 B757, and 3 B777. Turkmenistan Airlines connects the country by air with Russia, Ukraine, Kazakhstan, Belarus, UK, France, Turkey, UAE, Germany, Thailand, China, India and other countries. The national air carrier plans to launch flights to Milan (Italy), Jeddah (Saudi Arabia), Ho Chi Minh City (Vietnam), Tehran (Iran) and Tbilisi (Georgia).